In the early 1980's Wally Conron was the puppy-breeding manager for the Royal Guide Dog Association of Australia. He received a request from a vision-impaired woman in Hawaii for a guide dog that would be compatible with her husband’s dog allergy. He initially thought that there was a simple answer – a Standard Poodle, but after 2 years and 33 trials, he still hadn't found a suitable candidate. It was then that he crossed a Standard Poodle with one of the association’s best-producing Labradors. The mating resulted in only 3 puppies. Coat and saliva samples from all three were sent to the Hawaiian couple. Of the three, one puppy did not irritate her husbands allergies. The puppy was named Sultan and later moved to Hawaii and proved a great success as the first labradoodle service dog. It didn’t take long before people heard about this first litter of ‘Labradoodles’. Wally received enquiries from many people wanting a Labradoodle as an allergy-friendly service dog, and also from many people interested in breeding these dogs. 27 of the 33 labradoodle puppies wally bred over the next few years went on to be succesfull guide dogs. Despite the undeniable success of the Australian Labradoodle as guide dogs, Wally eventually gave up on the idea of creating a new allergy friendly breed of dog to serve as service dogs because because of the breeding politics and regulations of the Australian kennel club. However, the combination of charm and allergy friendliness had already captured the imagination of many and others took up the project. Today, Wally Conron is recognised as the creator of the Labradoodle, having bred the first litter, but the real success story came in later years when breeders in Australia further developed the Labradoodle by infusing other breeds, namely: English Cocker Spaniel, American Cocker Spaniel, Irish Water Spaniel and the Curly-Coat Retriever. These infusions were carefully done by several expert breeders to reinforce the lovable personality of the Labradoodle while at the same time increasing consistent allergy friendliness. 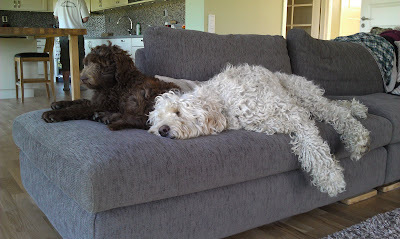 Breeders referred to these dogs as Australian Labradoodles to differentiate them from Labradoodles which had only Labrador and Poodle bloodlines. The resulting dogs were so fantastic that the Australian Labradoodle attracted huge interest world wide. Breeding dogs and pets alike were exported globally as the world fell in love with these fantastic dogs. Unfortunately "doodle mania" took the world by storm and many breeders starting producing poodle crosses to make some quick cash. Poodles were mixed with everything imaginable from schnauzers to rottweilers. These sometimes lovely, but often disastrous and non allergy friendly mixes were not done with the same knowledge or care as the original carefully selected labradoodle. Often health testing was skipped in order to save money. The name of the game was to maximize profit and minimize expense in a race to meet the exploding demand for doodles. In response to this out of control situation, lovers of the Australian Labradoodle became worried for our wonderful albeit still young breed. As a result several Australian Labradoodle associations were put into place for the protection of the breed. These associations are in place to ensure that breeders carry out good breeding practices, to protect this still developing breed and to keep clear records so that one day Australian Labradoodles will become a recognized breed by the various kennel clubs world wide. 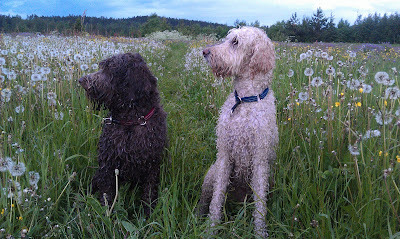 Three Australian Labradoodle associations oversee the breeding and registration of Australian Labradoodles world wide. Each club has code of ethics, required health testing, regulations regarding inbreeding and a breed development plan for this wonderful new breed. In Europe the overseeing club is the ALAEU, or the Australian Labradoodle Association of Europe. In north America and Australian respectively the Australian Labradoodle Association of America and the Australian Labradoodle Association serve the same function. 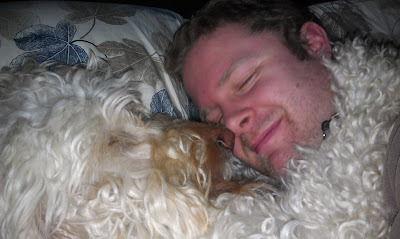 *The majority of this text was taken from the Australian Labradoodle Association of Europe website.